This isn’t my first rodeo. I’ve been down this shrimp and grits road before… and I’ve taken you with me. My last encounter with a warm dish of creamy grits and spicy shrimp was served to a gentleman whose only remark was that I had failed to remove the tails from the shrimp before serving them to him. Really, dude? Really!? So ended that short relationship (not really… but sort of… FOR REAL). I needed a redo. Not for flavor’s sake, just for my own self… and because I totally just wanted a giant bowl of this madness. New dating rule #37: I graciously and happily remove a cooked shrimp tail for every car door that is graciously opened for me. Respect, yo! ps. I don’t actually have thirty-seven dating rules. I do, however, have two giant bowls of lunch. Who’s counting (I am). I made these Shrimp + Grits with my friend Jonathan. I bought the shrimp, he crashed my house with beer, cucumber, and lime… and we shot pictures on the floor by my front door (see Instagram) (we’re really fancy). Jonathan made a bonkers cocktail to pair with the Shrimp + Grits… a Cucumber Blonde Bloody Mary. It’s fizzy and refreshing. 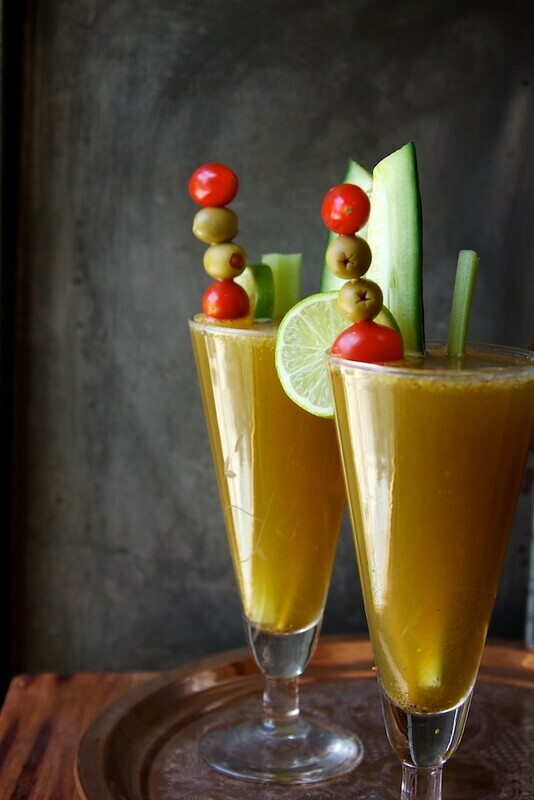 It’s takes the tomato thickness out of the traditional Bloody Mary and makes this cocktail truly gulp-able. In addition to being an awesome bringer-of-cocktails-to-my-house, Jonathan is also an incredible photographer, baker… and he’s obsessed with my cat. All the things I look for in a friend. 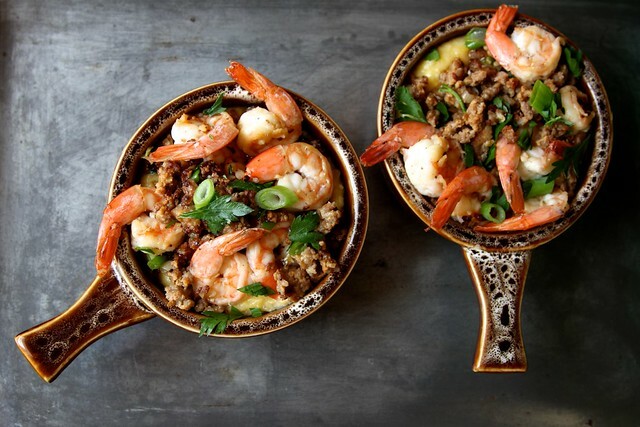 If you need some Shrimp + Grits inspiration, you’ve totally come to the right place. You can count on two things when Shrimp + Grits come out of my kitchen: the grits will be cheesy, and the shrimp will be buttery. Please don’t call the diet police. Grits are cooked up with a hearty handful of sharp cheddar cheese and a big pat of butter. Salt and too coarsely ground black pepper make nice additions. Before cooking up the shrimp, I sautéed spicy Italian sausage with a bit of garlic. The sausage adds another level of flavor and spice with a saltiness that speaks to my heart. Green onions, a good squeeze of lemon, and fresh parsley are added as bright finishing touches. This is my comfort. I’d like a pillow made out of Shrimp + Grits. No… wait. That’s impossible. Instead I’d like a pillow made out of Chocolate Chip Challah, with a side of Shrimp + Grits. That makes no sense, and yet I’m going to let it stand. Shrimp + Grits is cornmeal gruel brought to its highest level. It’s warm and comforting, and really… make sure you only take the tails off the shrimp for someone you really love. It’s worth waiting for. 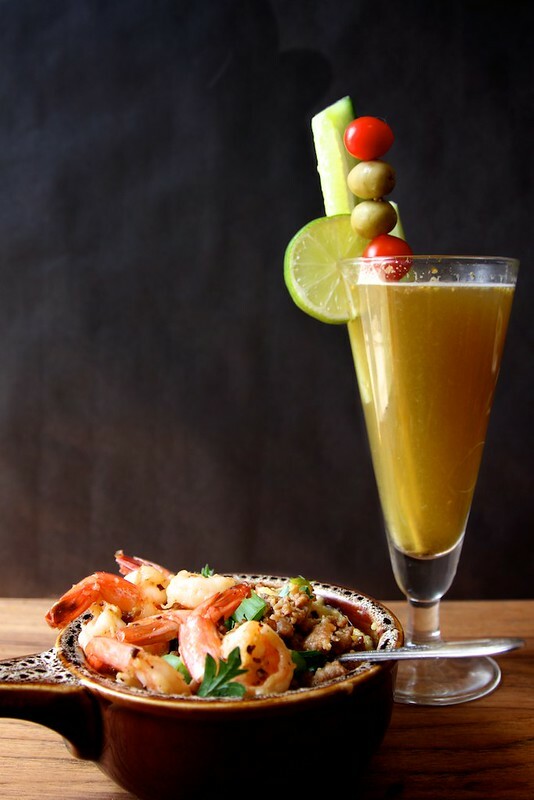 Spicy shrimp + Cold Beer Bloody Mary… such a major win! Bring water to a boil. Add grits to the boiling water while whisking to prevent clumps. Add a bit of salt and pepper. Lower heat, bring to simmer and cover until water is absorbed. Follow the directions on your box of grits or polenta. 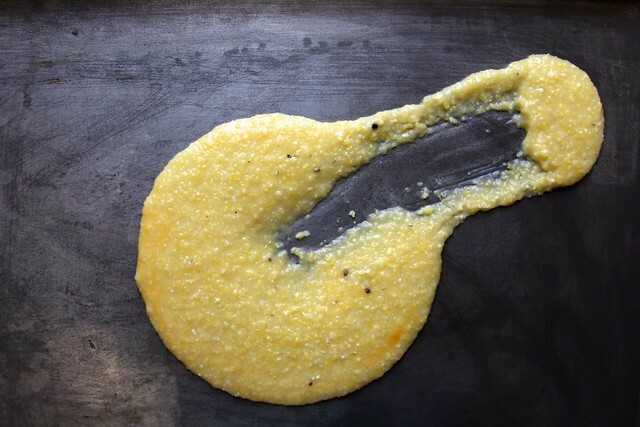 Cooking times vary, my coarse grits cooked up in about 15 minutes. Once thick, remove from heat and stir in butter and shredded cheese. In a medium skillet over medium heat, cook up the sausage. Remove the meat from the casing (if it’s in one) and break the meat into small bits with a spoon as it cooks. Once the meat is cooked through, add the garlic and cook for one minute more. Add shrimp and cook until shrimp turn pink. Add lemon juice, scallions, and parsley. Cook for another three minutes. 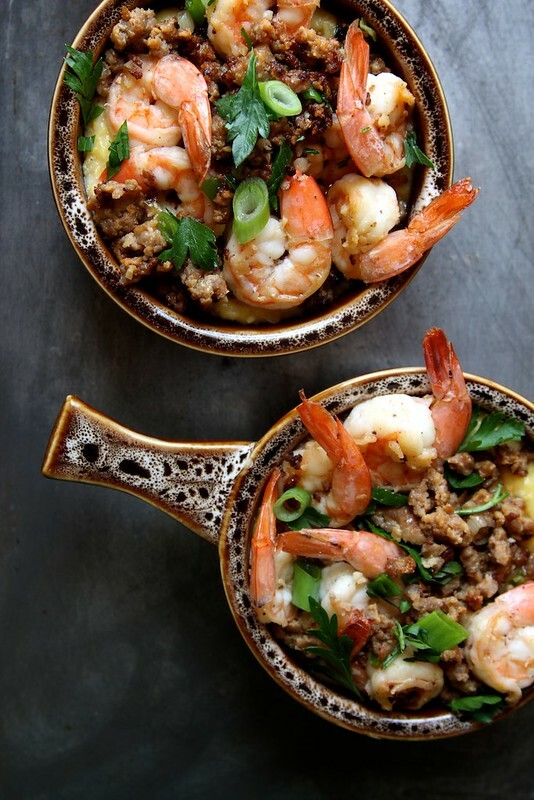 Spoon the grits into a serving bowl and top with shrimp mixture. Serve happily. This look delicious! 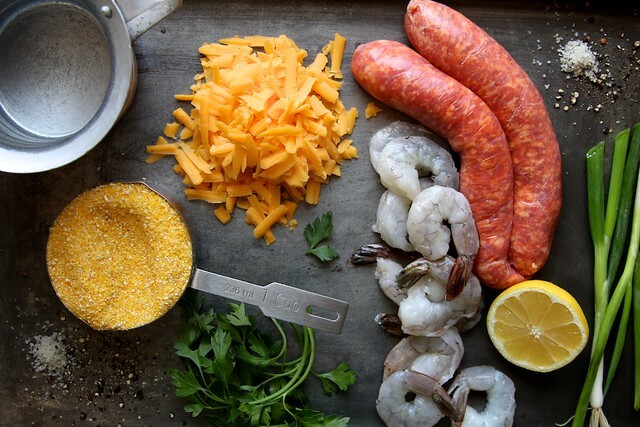 I the the sausage, shrimp and grits! It is like the perfect combo! 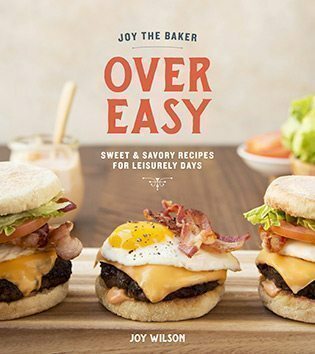 Looks great – can’t wait to try. I was looking for something new and different (for me), and this is it! Oh how I’ve created those similar kinds of rules. My problem used to be that I just wanted to make all my dates a warm bowl of something when in reality certain ones only deserved the stale lime tortillas in my cabinet and that last single semi hard slice of kraft cheese in the back of my fridge. Soooo I’m totally high-fiving your #37th rule! Looked at Jonathan on Instagram, couldn’t resist. L-O-V-E a boy who wears saddle shoes, or a girl for that matter. Maybe it’s the saddle shoes. 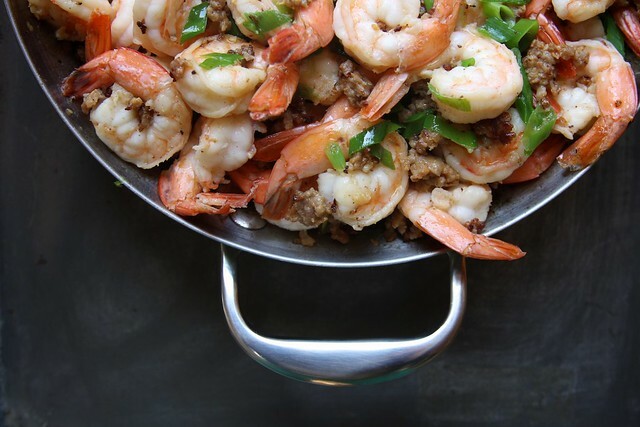 I love the addition of the Italian sausage to the shrimp mixture. Seems like the perfect thing to add to an already fab dish! Oh, to have good friends to cook with and enjoy food on the floor with. I need a friend like that. Also, I need to get down on grits. I have cornmeal. Not sure of it’s expired but I have them and I really should make this. Mmmmmm I love the look of this, its fab!! Ive never tried it but I think Im going to have to make this for sure!! Yum!! I just have to say that reading your work makes me laugh, a lot. Shrimp look great too. oooo-weee love me some shrimp! I don’t eat shrimp or meat but I could certainly help you out with the bloody mary. Looks awesome! And I love the bowls you used and your photos are beautiful, Joy! Why am I up past midnight looking at food?! I have to be up in less than 6 hours. This looks amazing! Also, where did you get those gorgeous dishes? when you post at midnight on Sunday, it’s 7am on Monday for me. Good morning, it’s going to be a great week!